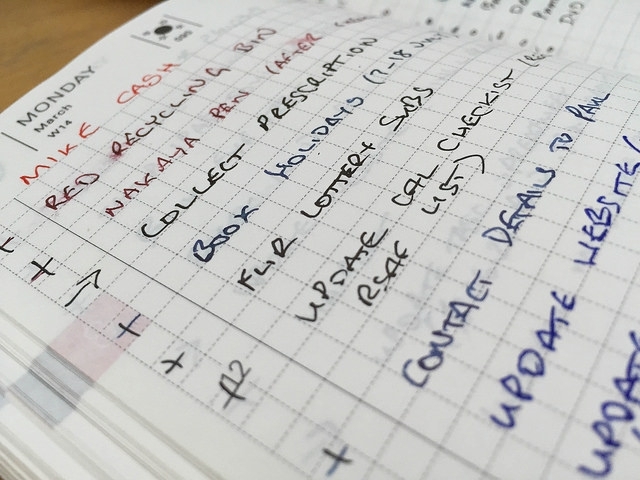 It’s one year since I started using a Hobonichi Techo as my daily planner and to-do list manager and I thought I would write a (not so) short reflection on why it has worked well for me. The Hobonichi is a small A6 daily planner or journal that first became popular in Japan but is now available in English. Users in Japan often have great affection for their Hobos and personalise their planners with covers and stickers. I’ve used electronic planners exclusively since April 1994¹ starting from a Psion 3a through to an iPhone. The planners and daybooks available with the Psion and its successors were very much an analogue of the traditional desk diary, combining tasks and events onto a single virtual page. In the last few years though there has been more of a focus on dedicated to-do applications, often based on David Allen’s ‘Getting Things Done’ (GTD) system. I’ve tried to follow GTD (or something similar) although ironically I never managed to finish reading Allen’s book! There are a whole host of applications that implement some or all of the GTD canon to allow users to manage their tasks and I’ve tried many of these. By nature I’m a tinkerer but I also like to follow a set of rules well. This means if I’m using an application I like to use it properly. With to-do apps there is often metadata associated with each task that has to be managed — ‘contexts’, start dates, parallel or serial activities. projects and others. And that doesn’t include the questionable attribute of ‘priority’. What this meant for me was that often found myself adding data to tasks that I would never use. Or whatever app I was using would not provide support for some feature I needed². There’s no question that software suites such as Omnifocus and Things can be tremendously useful, they are just not for me. When I started to read some very positive reviews about the Hobonichi Planner and its fountain pen friendly paper in late 2013 I decided that the time was write to step back from software solutions and give this a try. Once I had my planner in my hand, the first thing that struck was just how remarkably small and light these books are. The Tomoe River paper they use is really lightweight but can be used with the thickest and wettest pens with very little bleed-through of ink. The result is that this is a book that is easy to carry around, completely unlike a traditional planner such as a Filofax. Fixed all-day events such as bithdays, anniversaries or national holidays. The to-do list for that day. Any appointments at the bottom of the page arranged by start time. The to-list system I’ve adapted is based upon Patrick Rhone’s ‘Dash/Plus’ metadata markup system for paper notes that cleverly marks each each task with the same start symbol ‘ — ’ and then modifies that symbol to show progress. As examples, a completed task changes the ‘ — ’ into a ‘ + ’ and a task that is waiting or delayed becomes a ‘ → ’. The beauty of this system is just how well it works in a paper planner. The arrow symbol work particularly well as it points in the direction to look for the related follow-up entry. Although Patrick Rhone advocates using a left arrow to mark a delegated task I prefer to use it to indicate a task that was completed early. Another great benefit of using a paper-based planner is that it forces a review of that day’s tasks before closing that book at the end of the day. The Hobonichi also includes ‘coming up’ sections for each month to capture future tasks and I use the blank pages at the end for long-term lists and ad-hoc project lists. In my experience there are two main problems using a paper-based planner compared with a software application. The first is that repeated tasks and events all have to be entered manually and individually. This makes it especially disappointing should a planned series of events changes half way through the year. Next year I’ve made it a point to make those entries in pencil. The second issue is that sometimes there will be need to note down a new task when the planner isn’t available. As I generally will have my phone to hand I’ve adopted a text-based workflow that uses the app Drafts 4.0 to append a task to a Taskpaper file stored in Dropbox. I can review these entries later on my PC or on the iPhone itself and transfer it to the planner at my convenience. I’m absolutely delighted with how well this first year with a Hobonichi has gone and I’m looking forward to next year’s book in the next three weeks. One unexpected side-effect of using the wonderful Tomoe River paper this year is a serious addiction to Seven Seas Writer notebooks such that I have nearly attained S.A.B.L.E status.